We’ve recently had a change in UI, resulting in a mostly blank left menu bar, among other things. We also have huge numbers of posts that don’t seem to be coming from the people that the EL&U tour claims as EL&U’s intended audience. English Language & Usage Stack Exchange is a question and answer site for linguists, etymologists, and serious English language enthusiasts. It's built and run by you as part of the Stack Exchange network of Q&A sites. With your help, we're working together to build a library of detailed answers to every question about English language and usage. We should also list the migration sites we can vote questions into: ELL and Meta. This way, visitors can self-select to post a question on EL&U, knowing that they’d be holding themselves to be part of the intended audience; or if they don’t think they are part of EL&U’s intended audience, they have a couple of other common places they can go to with a single click. I suggest we copy the blurb from the EL&U tour into the left menu, and link to both ELL and this Meta. 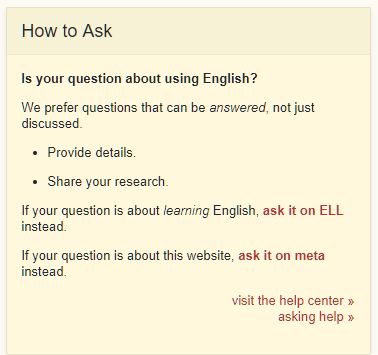 We could even show the ELL blurb next to the ELL link so that it is clear how the two sites differ. If we want people to know the rules, we have to tell them the rules instead of expecting something vague to guide them. For example, I'd support having some version of the Stack Overflow Question Wizard if that feature ever goes anywhere. Alternatively, I'd support a customizable advice page. I'm afraid I doubt that another similar panel in the left-hand space would be any more effective at stemming the tide of basic questions which should go elsewhere. Not the answer you're looking for? Browse other questions tagged feature-request theme-2018 .